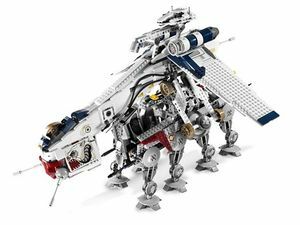 10195 Republic Dropship with AT-OT, is a Star Wars: The Clone Wars set released on March 27, 2009. It contains a Low Altitude Assault Transport/carrier (LAAT/c) and an All Terrain Open Transport (AT-OT) walker as used by the Grand Army of the Republic during the Clone Wars. The set includes six Clone Trooper and two Clone Pilot minifigures. 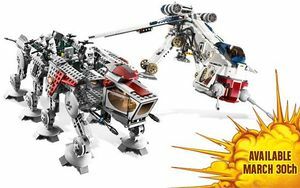 This set is considered to be both a Clone Wars set and an Ultimate Collector's Series set. So far, this set comes with more Clone Trooper minifigures than any other set released. The Dropship features movable laser cannons, flick-fire missiles, an opening cockpit and storage area, large wings, and a Technic locking pin. 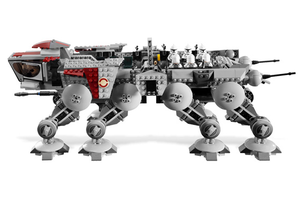 The sides of the front module feature alternative nose art designs, one of a Wampa beast and the other of a clone arm holding a battle droid head. The sides can be lifted to reveal a small storage area containing a platform holding eight spare flick-fire missiles. There is also a small flap at the back of the front module, leading to the same storage area. The cockpit is mounted on the top of the front module, and has room for one pilot. The transparent canopy is hinged to allow the pilot access. Two movable ball turrets, similar to those on 7676 Republic Attack Gunship, are mounted at the front, in the Dark-Red section of the front. Further up the sides of the Dropship, there are small cannons on each side. The carry handle is located at the top of the sloped body of the craft. It is normally concealed, but can be easily swung upwards for access. Large engines are located on either side of the handle, mounted on the top of each large, sloped wing. On the underside of each wing, a flick-fire missile launcher is located. Each launcher holds four red-tipped missiles, which can be fired all at once by pressing or flicking a switch on the back of the launcher. The Dropship carrying the AT-OT Walker. The large Technic pin used to carry the AT-OT, AT-TE and Turbo Tank is located underneath the carry handle, for maximum stability when carrying a vehicle. If the pin is pulled back it will automatically lock on to the vehicle's carry-handle when placed over it, sliding across and snapping into place. To release the vehicle the pin must be pulled back once again. On either side of the pin there is a white arm with a grey disc at the end. The arms are attached to rubber bands and secured by Technic pieces, so they act as supports when the craft is on the ground, and only lower slightly when lifted into the air. On the rear of the craft there is another moveable ball turret, also similar to that on 7676. The AT-OT features a splitting cockpit, four movable laser cannons, eight movable legs, seating for sixteen troopers, a carry-handle and a boarding ramp. The cockpit is at the front, and seats one pilot. The extra armour on top of the cockpit can fold back, the sides swing away, and the front, with the roof attached, folds downwards. The whole cockpit can also be swung backwards, allowing for the Dropship to fit onto the walker. One laser cannon is on each side of the cockpit, and both can tilt up and down. Each of the legs is hinged at the foot, as well as, to a limited extent, at the top. The open "bed" of the walker has seats for sixteen troopers, as well as mounts for six blasters, which are located on the large armour panels on the sides. The reinforced carry handle is in the middle of the "bed", secured by Technic pieces to allow it to be safely lifted by the Dropship. The carry handle can also be held in place by the tip of a small yellow pin, which falls away when the walker is lifted. The boarding ramp is located at the rear of the walker, and can fold down. However, if the ramp is made to touch the ground, even with all of the walker's legs bent, the ramp is unusually steep. The ramp has a movable ball turret on each side of it, similar to those on the Dropship. The stickers used in the set. This set includes two pairs of special decals that can be placed on the large plates underneath the cockpit. These can be used to customize the dropship to be either the one that appeared in the Battle of Teth, a ship with a Wampa Beast's head painted on each side, or to have a clone arm holding a battle droid head. 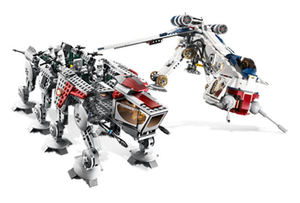 LEGO also included two sets of special decals, much similar to these in the earlier 2008 set; 7676 Republic Attack Gunship, allowing users to customize the look of their gunship, just like their dropship. The "Republic Dropship", also known as the LAAT/c or Low Altitude Assault Transport/carrier, was a LAAT carrier gunship employed by the Grand Army of the Republic during the Clone Wars, manufactured by Rothana Heavy Engineering. It was designed primarily to airlift assault walkers and other heavy cargo into battle. Similar in design to the LAAT/i, the carrier gunship removed the infantry model's troop hold, and featured heavy-lift agrav drives that held payloads in place under the main hull, as well as removing most of the LAAT/i's weapons, leaving only the three anti-personnel laser turrets. Using their combination of anti-gravity, repulsorlift and magnetic technology, the carrier could airlift in heavy vehicles such as Stun tanks, Saber-class fighter tanks, HAV A6 Juggernauts, RTT transports, AT-XT and AT-TE. These carriers were used throughout the Clone Wars, and saw use in many battles, notably the First Battle of Geonosis, the Battle of Teth and the Second Battle of Geonosis. They also saw limited use in the Imperial Period, airlifting in PX-4 Mobile Command Bases. The AT-OT or All Terrain Open Transport was a walking troop carrier used by the Grand Army of the Republic during the Clone Wars, manufactured by Kuat Drive Yards. Unlike other walkers in Kuat Drive Yards' AT-series, it was not designed for combat. Instead, it was used to reinforce armies behind friendly lines as a cargo walker. AT-OT walkers had enough seats for at least 34 clone troopers, but they could carry more troops if required, thanks to the open-bed design. Although these eight-legged walkers were well-armored and equipped with four laser cannons for defense, their open tops made them extremely vulnerable to attacks from above. With the open top design making transport of troops a risky endeavor, the personnel walker was commonly used throughout the Clone Wars far from the front lines, only traveling far enough to deposit troops at the outer perimeters of battles. They participated in the Outer Rim Sieges, most notably in the Battle of Felucia, where the heavily forested terrain provided cover. In the Imperial Period they were replaced by AT-TEs modified for cargo transport. This set was originally scheduled for release on March 30, 2009, but was released slightly early on March 22, 2009. 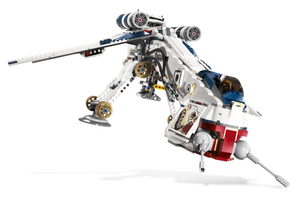 The sets were also ordered to be distributed to shelves in LEGO Stores as soon as the sets arrived, which was around the time of the above date. The set includes the most Clone Troopers in one Star Wars set ever made. The set is the largest Star Wars: The Clone Wars set made, and also the largest Star Wars set of 2009. The set was discontinued in 2012. Part:85921 is unique to this set. Part:2695 in Dark Red and in Earth Blue is unique to this set. The Dropship can also pick up the 7675 AT-TE Walker and 8098 Clone Turbo Tank. The AT-OT Walker can seat as many as sixteen minifigures. 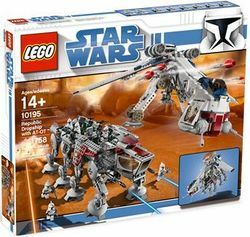 The box art refers to the set as "10195 Republic Dropship with AT-OT", but LEGO.com referred to it as "10195 Republic Dropship with AT-OT Walker". This is a description taken from LEGO.com. Please do not modify it. Two incredible Star Wars™ vehicles in one! 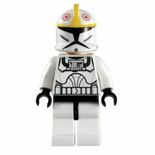 Includes 2 Clone Pilot™ and 6 Clone Trooper™ minifigures! Republic Dropship automatically locks onto AT-OT Walker™ and releases with the push of a switch! Dropship measures over 18” (46cm) long and has a wingspan of over 21” (53cm)! AT-OT Walker measures over 16” (40cm) long and 5”(13cm) wide! Facts about "10195 Republic Dropship with AT-OT"
Two incredible Star Wars™ vehicles in one! This page was last edited on 15 March 2016, at 04:43.